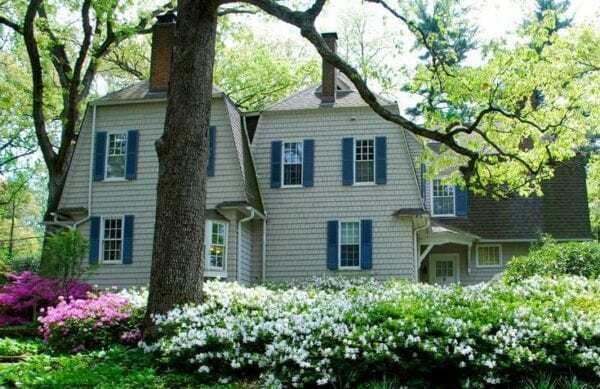 Country House On 1.7 Acres, Loaded With Charm, In Sudbrook Park: Where? Number 1007 Windsor Road was designed by the architect Lawrence Fowler, whose lovely, English-style homes were built throughout Baltimore’s more prosperous neighborhoods in the early part of the 1900s. It is an unpretentious country house, with gambrel roof and cedar shakes, built in 1911 for “a maiden woman of comfortable means,” who was a personal friend of Fowlers. The house has been well-maintained and updated over the years; its original cedar shake roof replaced by architectural shingles in 2003, all the windows removed, restored, reglazed and replaced, a new HVAC system installed and the house completely weatherized. Attic and basement are amazingly clean and dry – storage will never be a problem here. Downstairs are nice living and dining rooms, family room, sunroom, new kitchen with granite counters and custom cabinets, and butler’s pantry as well as several screened porches. All five bedrooms are upstairs: the master bedroom on the second floor adjoins a large dressing room, which could easily be converted to a bathroom. Overall, this is a charming and comfortable family house in a picturesque setting. Where: Sudbrook Park is a neighborhood of winding roads and majestic trees. There are about 500 houses, about 150 of which are part of the original plan for Sudbrook Park. Just off of Reisterstown Road in Pikesville, the easiest access is probably from Old Court Road via I-83 and the beltway. It’s near the Millford Mill and Old Court stops on the Baltimore Metro, so there’s good public transport to downtown and Johns Hopkins Hospital. Nearest shopping is Reisterstown Road in Pikesville, (Trader Joes!) Nearby private schools include McDonogh, Park and Garrison Forest. The public elementary Wellwood International School offers French language immersion, and students can attend Towson, Carver and Western public high schools. Why: Window seat in dining room. Country-in-the-city feeling. Why Not: Some wall-to-wall carpet that might not be your style. NB: Tight community, family friendly, interesting neighbors… artists, teachers, Hopkins docs, professors. Another tempting house – Cynthia’s descriptions make you think about moving! Thanks Kathleen, but I hope your not actually thinking of moving ….